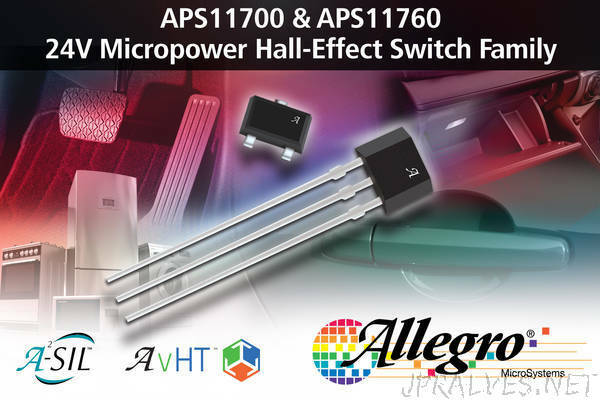 “Allegro MicroSystems has announced the release of a family of Micropower Hall-effect switch ICs—the APS11700 and APS11760—designed specifically for battery powered applications in harsh industrial and automotive environments. Automatic power management enables average supply current as low as 6µA while operating directly from a vehicle battery or other unregulated supply. The power management happens in the background and is transparent to the host system, making them a drop-in upgrade for existing Hall-effect switches or a solid-state replacement for mechanical microswitches or reed switches. “Thanks to the APS11700/760’s unique combination of ruggedness and ultra-low power, there is finally a reliable, solid-state upgrade for reed and microswitches, even in the most power-sensitive applications where the sensor will be connected directly to the battery,” explains Jim Judkins, Product Line Director for Allegro’s Position Sensor ICs. The APS11700/760 devices come preconfigured with the user’s choice of magnetic sensitivity, thresholds, and polarity; there is also a choice of active-high or active-low output for ease of integration into electronic subsystems. These ICs are qualified to AEC-Q100 Grade 0 and compliant with ISO 26262:2011 ASIL A when properly applied, making them suitable for automotive and other safety systems. They can tolerate up to 40 V and junction temperature up to 165°C. In addition, they are internally protected against overvoltage, reverse-battery, load-dump, output short-circuits, human-body-model ESD up to ±11 kV, and other EMC conditions.